Here is the trouble with this arguments like this—Nexus One vs iPhone 3GS—technology changes and advances so quickly that it’s almost like every couple months someone else is winning the battle. What will happen to Google’s Nexus One phone once Apple unveils its new iPhone 4G? It will be old news, and Apple’s new iPhone with its speedy software and sleek hardware will take center stage. On to memory and yes you guessed it the Nexus One wins this one due to it incorporating microSD expansion unlike the iPhone 3GS. The two phones are similar in size with the iPhone 3GS being 115.5 x 62.1 x 12.3mm with a weight of 135 grams, while the Nexus One measures 119 x 59.8 x 11.5mm weighing in at 130 grams. In the case of wireless connectivity, both handsets being quad-band GSM, 3G/GPRS/EDGE/WiFi and Bluetooth, the phone measure up to be quite similar. The only difference may be that the Nexus One includes a microUSB port which the iPhone 3GS doesn’t have—giving it a leg up in connectivity on Apple’s smartphone. 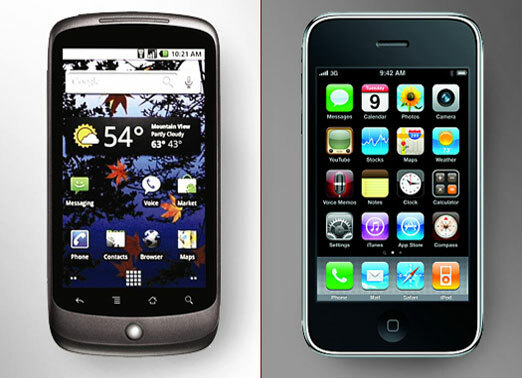 Apple’s iPhone 3GS has a 3.5 inch capacitive multi-touch screen at 480 x 320 pixel resolution, while the Nexus One sports a 3.7 inch WVGA AMOLED display. We think the Nexus one’s larger screen takes the win in this round. The iPhone 3GS packs an ARM Cortex A8 600MHz, while the Nexus One packs a Qualcomm Snapdragon 1GHz processor—we may have to go with the Google phone, because Qualcomm Snapdragon processors are speedy little devils. If you’ve tried taking a picture with your iPhone, then you’ll know which smartphone will win this battle—Google’s. The iPhone 3GS’ major problem is its lowsey 3.15 megapixel camera with shabby auto-focus and no zoom or flash. The Nexus One however, packs a 5 megapixel camera with auto-focus, LED flash and 2x digital zoom. The winner of this battle is the Nexus One. We probably don’t need to explain why the iPhone would win this one, but we’ll do it anyway and in the simplest way possible—the iPhone is essentially an iPod. The google Nexus One has a media player, but when it comes down to it Apple’s iPhone has a way better media player.